Dr Gopichand Katragadda, then Chief Technology Officer at the Tata Group, spoke at the India Innovation, Intellectual Property and Competition Conference organised by ISB in New Delhi in March 2018. Professor Anand Nandkumar caught up with him afterwards to understand how organisations can build innovation cultures in the digital age. Anand Nandkumar: Setting up a group within a company to assist the entire group’s innovation activities, is a new phenomenon in India. Let us start by understanding how exactly the Chief Technology Officer’s team facilitates innovation at the intersection of all the companies. Gopichand Katragadda: The key word, in fact, is facilitation, rather than supervision. That is the way I looked at the team’s role as the first Group CTO. Yes, Tata Group is a large conglomerate, with multiple independent companies, sometimes independently listed. The organisational structure was very different from General Electric (GE) where I was earlier. There, the structure is centralised with the parent company. So we had to make sure that the laws of the land were adhered to and also that synergies were taken advantage of. We identified three broad areas of how we could make it happen. One was to actually play a role in delivering technology. We did this with three or more companies working together. That gave us scope to play a facilitative role. Since we are a small team at the group level, we needed to ensure that we are impactful. So we laid down a ground-rule that we pick programmes which would impact 100 million people positively and have the capacity to generate a profit of $ 100 million a year for the Tata Group. This was our second consideration. The areas we picked were Energy, Food and Wellness, Factory internet of things (IoT) and Digital Consumers. Then within each area, we picked specific programmes. For instance, fuel cells and graphene fell under energy. Since we are a small team at the group level, we needed to ensure that we are impactful. So we laid down a ground-rule that we pick programmes which would impact 100 million people positively and have the capacity to generate a profit of $ 100 million a year for the Tata Group. In all the areas, we have delivered the products or services and we are now conducting pilots for commercials. At the group level, we have also facilitated collaborations for strategic relationships with universities /institutions like Harvard, Yale, Indian Institute of Technology (IIT) Kharagpur, IIT Madras etc. We do this with large companies too. With Lockheed Martin, we have facilitated a relationship with Tata Trust on the India Innovation Growth Programme. With Dell, SAP and Microsoft, we have been able to provide the group face to be able to partner better. And finally, our third consideration was that we make each organisation more innovative. This consideration would be on a demand basis from the organisation, together with some group-level activities. In fact, on 2 and 3 May (2018), we will be celebrating Innoverse and Innovista. Innoverse is our open innovation platform developed at the group level, but within companies, and later deployed across the group. Last year we opened it up to the world! Today, we have 100 challenges and 10,000 solvers looking at the challenges. Some of them have been selected by the companies and are being piloted. On Innoverse Day, we are going to make presentations on some of the challenges and also give demonstrations. Innovista is a celebration of innovation within companies. We also do Innovation Edge where the CEO and his or her core team identify areas. Here we do technology road mapping, design thinking, CTO and CIO forums. This is how we ensure that we are facilitating individual companies to better themselves. So broadly these are the three areas that we picked and we have been working on these lines for the past three years plus. Could conflict of interest make the team’s facilitation role a bit tricky? Say some companies want to do their own R&D project, or find their own path to R&D and have their own vision. Would part of your team’s function then be to help companies align their R&D vision with the group’s? In other words, integrate the company vision with the long term strategic vision of your group? If an individual company is doing a strategic vision on technology and innovation, I think it is commendable. In fact, ours is a non-intrusive approach. We don’t interfere unless companies request for assistance, and they are free to utilise all the capabilities that we provide. We interface with companies in different ways. For instance, I am on the Boards of certain companies. Then there is the Tata Business Excellence Model which encourages companies to articulate aspects of their business and indicate how they will excel, including in technology and innovation. Our role is to help companies along their journey in the way that they would like to take the journey. In fact, if they are already doing well, we present their practices as examples to other companies. The point is that if you are adding value, only then companies are eager to come and be a part of the process. And I think we have been successful in adding value. Our role is to help companies along their journey in the way that they would like to take the journey. In fact, if they are already doing well, we present their practices as examples to other companies. Given your experience and inclination towards the digital world, how do you think the advent of digital technology, will impact the competitive landscape of Indian firms and those competing abroad? GE has taken the lead and ventured into the digital world with Industrial IoT. They have a clearly articulated vision. Similarly, each one of our companies has articulated their approach to the digital world. In fact, Tata Consultancy Services (TCS), a very large digital company, has partnered with GE in creating Predix, which is the digital industrial IoT platform. TCS has many customers and their approach to digitisation and automation of services is unique. Its product Ignio, for example, will automate services. So, the bread and butter of TCS which was to provide services through deployment of trained professionals will become obsolete. In fact, TCS has created the best method to automate using artificial intelligence systems, which will listen in on your infrastructure to pre-empt problems and solve them. There are other companies too, like Tata Elxsi which works on embedded systems. Tata Communications enables the entire communication infrastructure, with a focus now on software-defined networks. So many companies are providing digital services to the world and not just to India. This means that the nature of the competition is also going to be different, in the sense that the so-called ‘non-traditional companies’ are also going to compete with the traditional companies in their respective domains. So this poses a challenge both within the group as well as outside in the marketplace. Could you share your thoughts on this phenomenon? Competition is welcome. It keeps you constantly innovating, and also ahead of the competition. But more significantly, it will drive TCS to say, let me develop a programme that will disrupt my own business model! In fact, Ignio disrupted the TCS business model. That is how you keep way ahead of the competition. Add to this the ability to scale. If you have the ideal combination of nimble thinking and the ability to scale, then that is what Tata group companies should leverage. The cases we teach in ISB on GE have undergone a sea change with the advent of digital technology. Changed technology has driven Google to compete in the automobile space. Similarly, Amazon may in the near future foray into healthcare and so on. How do you think this convergence will change the competitive landscape within India? Businesses are constantly being redefined and this is not new. Apple started as a computer company that ventured into the music industry and then into the phone industry. It redefined traditional players and in fact eliminated some of them. This trend will continue. Companies which are not nimble and connected to the market will inevitably face threats. The only choice then is to reinvent your business. Businesses are constantly being redefined and this is not new. Apple started as a computer company that ventured into the music industry and then into the phone industry. What India has to be conscious about, however, is that we have to provide 100 million new jobs in the next decade. So while we talk about engaging in automation of services, what this implies is that the nature of a successful profile will get redefined. You will need to identify a particular profile and retrain. These processes will be required by companies playing in the digital world. So, the bottomline is you have to change your business to become the source of automation for the world just like you became the source of IT for the world! If we take the example of the automotive business, electric vehicles and connected cars will soon be a reality. An electric vehicle means that your entire drive chain and supply chain will change. What was a competitive advantage for you will also change. Today, India is conceptually abreast of and is, in fact, ahead of the thinking around electric vehicles and connected cars. But in this scenario, to stay ahead of the competition, companies with digital technology entering the automotive business will have to play at level 5 automation because that is how they are going to win. Companies with digital technology entering the automotive business will have to play at level 5 automation because that is how they are going to win. India, however, will have the prerogative to say, we are not ready for level 5 automation and not for level 4 automation either, so we will opt for level 3 automation. The advantage India will have is that the three technologies up to level 5 automation can be leveraged to level 3 automation. Ironically at that point of automation, digital companies do not have all the advantages that we have. So, the point is you have to play to your strengths. Coming to automotive design, I was talking to a colleague in the area. Interestingly, the way we perceive a car when we sit in it has to do with the shape and feel of the car. My colleague would not consider some of the newer cars as competitive unless you are also building in the knowledge to electrify and connect them. Over and above these factors, however, you must design them with both the look and the feel of a car! Right. And that calls for a rethink of what a car means! So are you making a case for design thinking as an important skill in the process of innovation? Yes, we are in fact facilitating design thinking for companies and we have already done several workshops in the automotive space. Your group has access to institutions, universities and labs worldwide. In the context of facilitating the culture of innovation in Indian firms, how does the Indian innovation ecosystem compare? Where do you think are the gaps and how can they be bridged? Who needs to address the issues– policymakers or universities? The industry certainly has a role to play. It should double its investments into innovation, R&D and technology. Unfortunately, since investment is poor, the first sign of a hurdle results in programmes folding up. Often, just on the threshold of success if expenditure goes up and becomes equal to what has been spent up till then, the programme shuts down. Those in charge do not realise that success is just around the corner! Unfortunately, the risk-taking ability which is freely applied to acquisitions and mergers is not applied as much to innovation. So this needs to change. As far as academia in India goes, the yawning gap is in the graduate programmes where there is little or no evidence of world-class research, barring a few exceptions. But a few exceptions will not change the big picture. So it has to be structurally made part of the plan. The gap exists partly because industry-academia partnerships are very poor. Another reason probably was the lack of government funding to universities. But that scenario has now changed with two government initiatives — the Uchchtar Avishkar Yojana programme mandates industry input and the IMPRINT programme encourages it. So there is marginal change. The risk-taking ability which is freely applied to acquisitions and mergers is not applied as much to innovation. So this needs to change. Another issue is that faculty has to be better rewarded with compensation packages which attract the best talent. University rules too need to be amended to allow faculty to work on their own programmes in summer. Alternatively, we could consider going back to the old system of paying faculty for 100% of their time and have all programmes routed through the university. And finally, the regulators need to be proactive in releasing regulations. A good example of something that worked well was in the financial sector. This was mainly due to proactive and quick movement by the regulators. I think we are one of the most innovative when it comes to deploying technology in the financial sector. But this is not true of other areas. A case in point is that of the October 2014 Directorate General of Civil Aviation (DGCA) ban on flying drones. Till date, there has been no release of the regulations which were supposed to come out within three months. Several drafts have been released but there is no final draft, with easy-to-understand instructions. You cannot innovate when regulations are holding you back. These are areas where India should be quick to implement regulation. In the agricultural sector, for instance, there should be a few simple rules that you follow in order to use drones. This is not an urban area where spying on your neighbour could become a risk factor, so why should regulation be delayed for agricultural land? Similarly, inside an industry, inspectors need not cause fear of breach of privacy. So, this is another area that can be freed up from regulations or have less regulation so that safety norms are not violated. Wherever possible, you should move fast to put simple regulations in place. These are areas where India should be quick to implement regulation. In the agricultural sector, for instance, there should be a few simple rules that you follow in order to use drones. As far as the government is concerned, what they should do with taxpayers’ money is look at programmes such as the small business innovative research programmes in the US, which fund small businesses below a certain size through government agencies, to encourage them to do innovative work. The idea is to use the findings for government needs. However, what is happening is that the government gives a license for commercial use to small businesses. Many innovations are launched in this manner. Wherever possible, you should move fast to put simple regulations in place. Also, large programmes from agencies are deployed through industries. So the government agencies put out bids for its very large programmes in millions and tens of millions of dollars where large companies compete and deliver the outcomes. In India, we do have the public sector, Defence Research and Development Organisation (DRDO) and the Council of Scientific and Industrial Research (CSIR), but I think we need to gradually move to a model where we have the private sector delivering innovations, and I think this will be much more productive. I’d like to now move on to a question about intellectual property laws, around which there has been a lot of debate, particularly in the context of developing countries like India. Although India is technically compliant, there are still questions about the implementation of intellectual property law. As head of R&D of a group spanning a range of industries, do you think we really need intellectual property laws? If so, should it be a strong intellectual property regime like in the west? What sort of intellectual property laws do we need? Intellectual property is, I think, the way to incentivise people to spend time, effort and money and to give themselves over completely to solving a problem, with the knowledge that they could reap rewards. And this has worked for many years in many countries. So, basically you are disclosing how you are going to develop certain novel technology in return for a period, typically of 20 years, when only you would be able to use it. After that, it is no longer in the patent regime. In this way, you have motivated companies and motivated individuals producing intellectual property. I am a strong believer that you need to incentivise. Whatever field it is, the failure rate is very high, almost 95%. Even in pharmaceuticals. A drug which they finally succeed in making, I think, should be protected to make their business viable based on the successful molecule. I think India has as strong an intellectual property law as anywhere in the world. It has been upgraded several times, and in the recent past too. So we have exactly what we need in terms of the law. The judges in our courts pass judgments which are sound. I think the problem is that we are understaffed and we need new models to speed up implementation. The government is taking some steps in this direction. And recently, based on the inputs that we have given, the government has introduced tatkal schemes for start-ups is at no additional cost. For larger companies, there is an additional cost to move things faster. We have started using these schemes, and I think this is the right move made by the government in the face of a shortage of resources. The next step in this area is to create jobs as well as privatise certain parts of the IP grant process, as has been done in the Passport Seva Kendras. And several companies would be happy to train people to be patent examiners. But in the final approval just like in the Passport Seva Kendra, we can go through the government apparatus. The current examiners are struggling not because of the lack of skills but because they lack the hours. The next step in this area is to create jobs as well as privatise certain parts of the IP grant process, as has been done in the Passport Seva Kendras. And several companies would be happy to train people to be patent examiners. What do you see as barriers to innovation in Indian organisations? In Indian organisations, at the individual level, the biggest shortcoming is the inability to be hands-on. We have people with intellectual ability who come up with great ideas. However, the ideas don’t mature because people are not hands-on. What is required is that if you are working on hardware, you need to be hands-on with hardware and if it is software, no matter what your designation is, you need to be hands-on with software. But hands-on also means that you need to work closely with the customer and figure out what are the problems to be solved. Sitting closeted in an office room trying to analyse which hardware or which problem to solve, will not get us there. So as individuals we need to be more hands-on. The need for skilling people is not about skilling them in theories. What we need to start doing is to skill people to be hands-on. Even the IIT entrance exam should, at some level, test for aptitude in engineering, and not base its exams on theoretical frameworks. There is a great need to bring in people who have the aptitude but may not be great exam takers. Documentation is part of your engineering effort and innovation. If you don’t diligently and meticulously document your work, you are wasting your time. In India, we do not document our work. We do not take notes in an engineering sense. If we are doing work, we need to document it, re-document it and pore over it. When you are immersed in what you are doing, you are a different person. Once you come back to work, if you have not documented it, you have lost 90% of what you have gained in those hours. So that is another big gap area for us. It is the realisation that documentation is part of your engineering effort and innovation. If you don’t diligently and meticulously document your work, you are wasting your time. 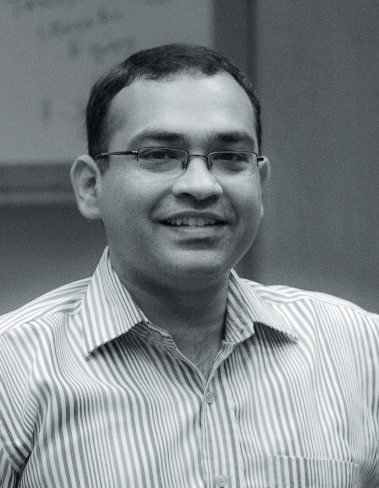 Gopichand Katragadda is Founder and CEO at Myelin Foundry and an Independent Director on the Broad of Bosch India. He was Group Chief Technology Officer of Tata Group at the time of this interview. Before that, he was Managing Director, GE India Technology Centre.